Tulianna and Alejandra Garces' elegant bracelet mimics the intricate, organic layers of a blooming rose. A rose blooms slowly. It starts by releasing its green leaves, and then—layer by layer—a vibrant burst of red unfolds. Tulianna and Alejandra Garces' elegant bracelet mimics the same depth and layering of the flower. 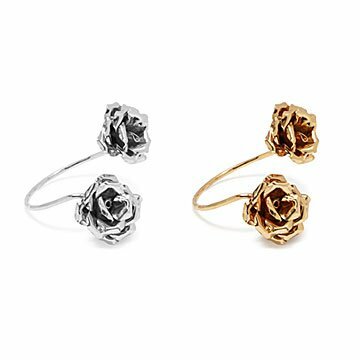 She delicately folds sheets of gold-plated bronze or sterling silver-plated bronze to make the floral tiers. Then, each blossom is attached to either end of a shimmering cuff. It's a sweet alternative to fresh flowers, and will delight friends inspired by nature. Handmade in Colombia.